NU ESTE NECESARA EFECTUAREA EVALUARII IMPATULUI ASUPRA MEDIULUI. Publicul interest poate inainta comentarii/observatii la proiectul deciziei de incadrare in termen de 5 zile de la data publicarii prezentului anunt. C.N. ADMINISTRATIA PORTURILOR MARITIME CONSTANTA S.A. pentru CHIMPEX S.A. anunta publicul interesat asupra depunerii solocitarii de emitere a acordului de mediu pentru proiectul “EXTINDERE CALE RULARE INCARCATOR NAVAL CEREALE” propus a se realiza in Judetul Constanta, mun Constanta, Str Incinta Port Dana 54-56. Informatiile privind proiectul propus pot fi consultate la sediul Agentiei pentru Protectia Mediului CONSTANTA, Str Unirii, nr 23, Constanta, Judetul Constanta, zilnic, intre orele 9 – 13 si la sediul beneficiarului, Incinta Port, Dana 54, CHIMPEX SA, in zilele de luni-vineri, intre orele 9 – 13. Observatiile publicului se primesc zilnic la sediul Agentiei pentru Protectia Mediului CONSTANTA, Str Unirii, Nr 23, Constanta, Judetul Constanta, intre orele 9 – 13. C.N. ADMINISTRATIA PORTURILOR MARITIME CONSTANTA S.A. pentru CHIMPEX S.A. anunta publicul interesat asupra depunerii solocitarii de emitere a acordului de mediu pentru proiectul “PLATFORME BETONATE DANA 63-64” propus a se realiza in Judetul Constanta, mun Constanta, Str Incinta Port Dana 63-64. C.N. ADMINISTRATIA PORTURILOR MARITIME CONSTANTA S.A. pentru CHIMPEX S.A., titular al proiectului: “RECONVERSIE SI DEZVOLTARE TERMINAL DE ULEIURI BRUTE” propus a fi amplasat in Judetul Constanta, Incinta Port Constanta, zona dana 85, anunta publicul interesat asupra luarii deciziei etapei de incadrare de Agentia pentru Protectia Mediului Constanta: nu este necesara efectuarea evaluarii impactului asupra mediului, in cadrul procedurilor de evaluare a impactului asupra mediului. In time for the wheat harvest 2017, our new world scale grain terminal in Constanta has been completed. The new state-of-the-art terminal has a storage capacity of 200,000 tonnes on 20 vertical cells, can receive cargo by barge (1 x 400 tonnes per hour), truck (2 x 400 tonnes per hour) and rail (1x 400 tonnes per hour), and has a vessel loading rate of 2 x 800 tonnes per hour. The investment over 42 million EUR is part of Chimpex’ and Ameropa’s ongoing commitment to provide best-in-class services to its customers, protect the environment, and ensure a safe working environment for its employees. 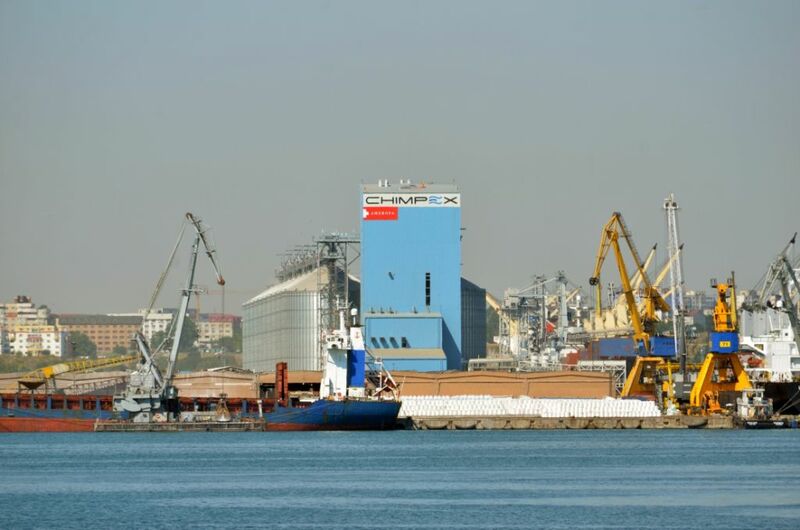 Chimpex, one of the largest port operators in Constanta, is involved in the social life of the community through CSR projects developed together with its employees. Between 22 – 26 of May, 2017 Chimpex organized a team building for the company employees, with CSR purpose, entitled “The troublesome bike”. The project “The troublesome bike” gathered Chimpex team members in finding the hidden pieces of the bikes and then assembling them in a determined period of time. The assembled bikes were donated by Chimpex to the children of a foster home in Constanta. Through this project and through the employees’ involvement, Chimpex succeeded in bringing a smile on the faces of those who can’t be fully happy. Chimpex has always considered of great importance and has paid special attention to the CSR projects, offering moments of joy especially to the kids from foster homes. This project is part of a series of projects with CSR purpose developed by Chimpex. On long term, through this type of projects, Chimpex reasserts its role in the local community and respects the way company employees choose each time to become involved in helping disadvantaged cases. NU ESTE NECESARA EFECTUAREA EVALUARII IMPACTULUI ASUPRA MEDIULUI. Free English language classes for the children of our employees. Under the motto “We want to invest together in our children’s future”, Chimpex launched during the month of April 2016 a program by which the employees can freely register their children aged 3 - 12 to English language classes. On 23rd of April, 17 children and their parents took part in a free English language workshop, during which the parents had the chance to find out more about the English classes, while the children enjoyed an Easter workshop. The classes are organized by Helen Doron, a global institution with over 30 years of success in teaching English to children of all ages. Chimpex has signed a EUR 27 million loan agreement with BCR to build a new grain terminal at the Black Sea. The contract was signed on March 11 and has a duration of 10 years. Chimpex will use the loan to build a terminal with a capacity of 200,000 tons in the Port of Constanta. The terminal will have an operating capacity of over 3.5 million tons of grains per year (wheat, barley, corn, rapeseed, sunflower, etc.) and will allow simultaneous unloading from trains, trucks, barges and loading to PANAMAX vessels up to 63,000 tons. Chimpex, an Ameropa subsidiary based in Constanta Romania, is pleased to announce that it has received the approval from the local authorities for the construction of a new grain terminal. This project is worth 44 million Euros, which represents a major investment for Chimpex as well as the port of Constanta. On-site work operations are underway, and the project is expected to be completed in two years. Once construction has finished, Chimpex will have the capability to operate a state of the art terminal capable of storing 200’000 tons on 20 vertical cells along with a loading rate of 2 x 800 tons per hour. This investment is part of Chimpex’s and Ameropa’s ongoing commitment to provide best-in-class services for their customers, protect the environment, and ensure a safe working environment for their employees. Chimpex finalize a new investment project of storage increase capacity: 63C horizontal warehouse for sugar storage. The new warehouse with a surface of 4500 sqm and a maxim height of 9,5 meters will allow Chimpex to store approx. 25’000 mt of bulk sugar in excellent conditions. Copyright © 2015-2019 Chimpex S.A.